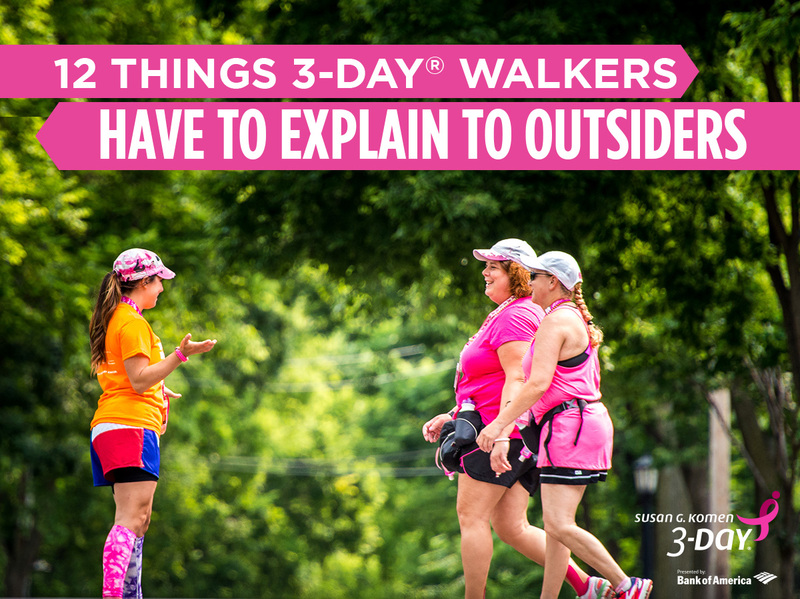 Anyone who’s been part of the Susan G. Komen 3-Day® understands that some aspects of the Komen 3-Day world may seem crazy or confusing to an outsider. Be patient. A little explanation gives these non- 3-Day® folks a glimpse into this pink world. 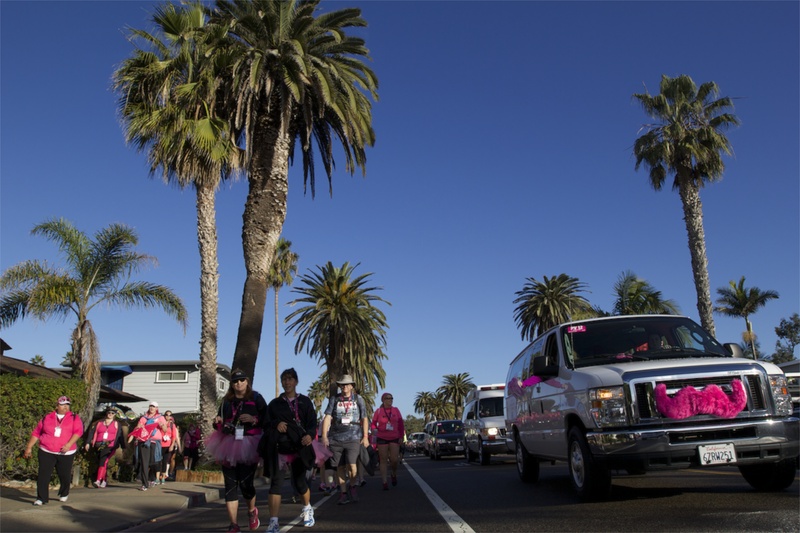 What Connects Us – First things first: you don’t have to have a direct connection with breast cancer to be part of the 3-Day (though for thousands of folks, those personal connections have been their biggest reasons for participating). 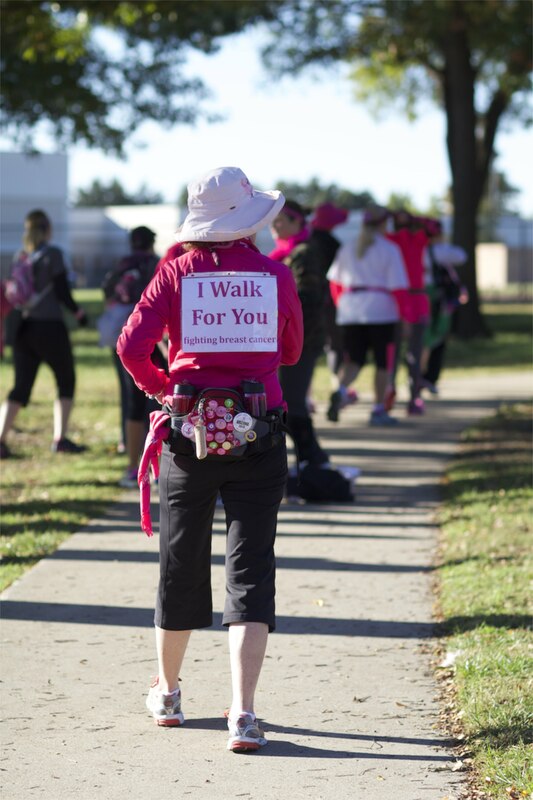 The fact is, 1 in 8 women will be diagnosed with breast cancer in her lifetime, so if a walker doesn’t know someone now who has been affected, chances are very good that they will some day; she may even be the one. We walk now to battle against that inevitability. Aside from that, the life-changing experience of the 3-Day is powerful enough to draw in just about anyone, regardless of their personal connection with breast cancer. Walking is a full-time job – Yes, we really do walk for three days in a row. No, it’s not non-stop, around-the-clock walking, but 20 miles a day takes around 8-10 hours for most people, so it’s pretty much all we’re doing for those three days. The Long Way – Speaking of extra walking, your friends may scratch their heads as to why you purposely park in the farthest possible spot at the mall, but you know the value of squeezing in some training wherever you can. Taking Care of Business – The thought of spending three days with porta-potties as the primary “facilities” might horrify some outsiders. You can assure them that the 3-Day’s temporary commodes are some of the nicest and cleanest portable lavatories there are. It’s a direct result of 3-Day walkers being courteous and hygienic when leaving their little plastic chambers, knowing that one of their fellow walkers isn’t far behind. The “bottom” line is: 3-Day people take care of each other, even whilst taking care of business. Sweeping Has Nothing to Do With Brooms – Some of your outsider friends might be concerned about what will happen to you if you get hurt while walking or can’t continue for some other reason. Explaining the concept of our helpful and creatively-themed fleet of Sweep vans will put them at ease and entertain them all at once. The Wonders of the 3-Day Camp – Yep. We sleep in tents, shower in semi-trucks and have an all-out dance party on Saturday night. Best home away from home ever. World’s Greatest Snack? – Two graham crackers. Peanut butter. Grape jelly. (Option: serve cold.) Come to think of it, you can skip trying to explain this one, as it defies description. Dieters Beware – I’ve had many people say to me, “You’re walking 60 miles? You must lose so much weight that weekend!” Uh, no. First of all, while walking is great exercise and the months spent training for the 3-Day can dramatically improve your overall health, losing weight on the 3-Day weekend itself should not be your goal. If there’s one thing that 3-Day walkers are, it’s well fed. Aside from the food provided at the 5-6 official route stops each day, there are also seemingly endless piles of candy, popsicles, cookies and brownies, and more, supplied by supporters all along the route. 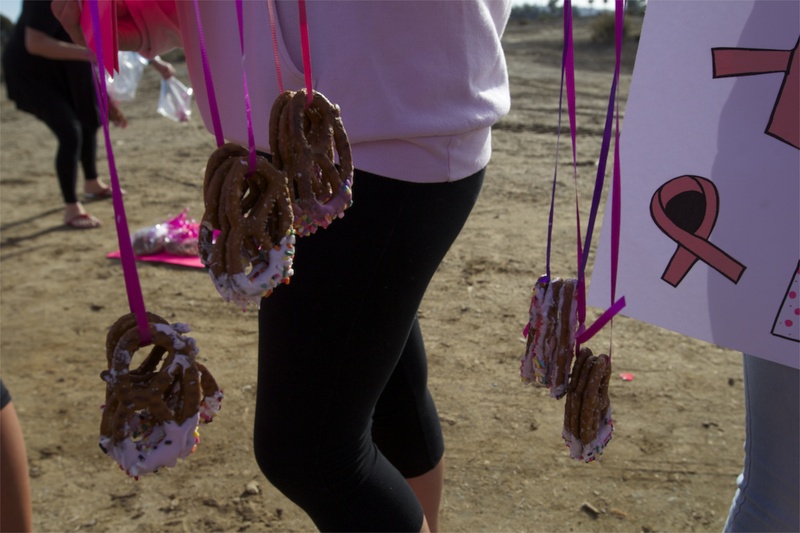 Many 3-Day walkers refer to the whole thing as the 60-Mile Buffet Line. You Know You’ve Totally Done This – You’re out on the sidewalk, a car honks its horn. What do you do? If you said, “Put my arms up and wave my fingers and/or give a thumbs up,” you might need to explain your behavior to an outsider. 3-peating – For some walkers, the 3-Day is a bucket list item to check off, but for many, once is just not enough. Over half of all 2015 3-Day walkers have walked at least once before and more incredibly, over 400 participants have been doing the 3-Day for 10+ years. Experiencing the magic of the 3-Day and continuing making an impact in the fight against breast cancer are powerful motivations for 3-peating. “When Will You Stop Walking?” – My answer when I get this question? When we don’t need to walk anymore, and not a day sooner. Do you know what the best way is to explain the 3-Day to an outsider? Invite them to walk with you! 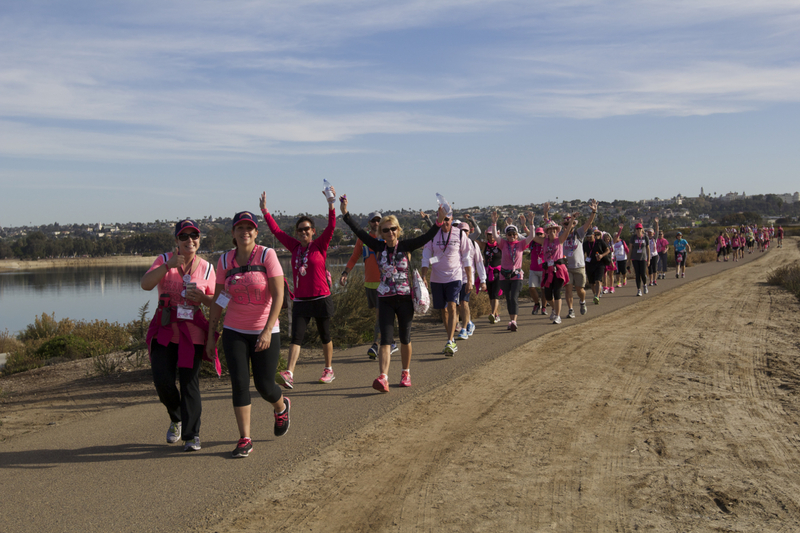 Registration is still open for all 2015 events at The3Day.org/Register. “Over 400 participants have been doing the 3-Day for 10+ years. ” I’ve always wondered how many other long-timers are out there in addition to me. Thanks for this little tidbit! This year’s walk will be my 19th event since I started participating in 2000. I am one of the 400. Oh, and #3 REALLY makes me cranky too! When someone says “Why do you have to train? It’s only WALKING!” I reply “I am ONLY WALKING an 18 mile training walk on Saturday, why don’t you join me?”. Shut’s ’em down every time!